In a conversation between Gibson and the scholar and critic Erika Balsom on the opening night of the exhibition—about conceptualisations of pregnancy and family as a metaphor for ethical relationships and building communities—Sara Ahmed’s description of citation practices as a form of ‘reproductive technology’ was referenced. Citations can create a connection between the past and future, interpreting time as a cyclical set of relations, rather than adhering to linearity: the present moment becomes an organising force. Throughout Crone Music, these citations and perspectives are resoundingly feminist and queer, forging a multidisciplinary lineage of solidarity, manifesting through friendships, relationships, and trans-historical inspirations. Gibson’s project is one of empathy, mentioning that she felt a palpable call to arms after becoming a mother, contributing to the shift in her practice which had previously taken male avant-garde figures as its subject. Her comments also brought to mind the research being undertaken by academics such as Catherine Grant into the re-enactment of histories of feminism in contemporary art and how looking at these past temporalities might relate to possibilities for the future. Grant’s 2011 article ‘Fans of Feminism,’ for example, considered the practice of contemporary artists who focussed on and highlighted second-wave cultural production and activism in their work. 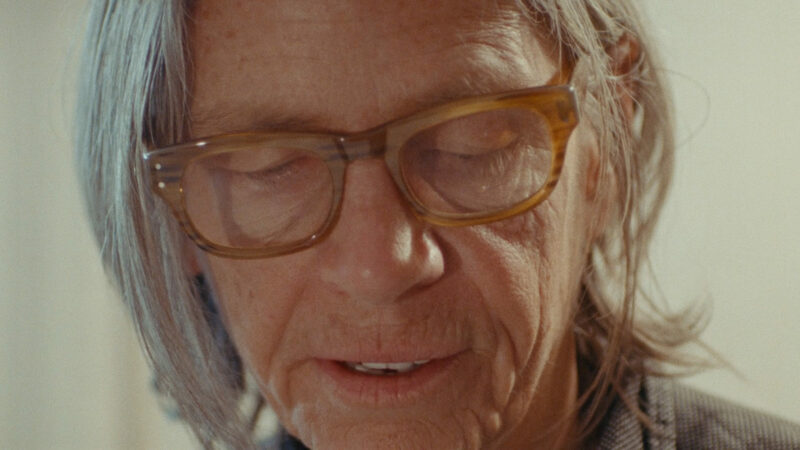 The title of Gibson’s 2018 film ‘I Hope I’m Loud When I’m Dead’, installed in Gallery 1, is borrowed from the poem by CAConrad, who is captured engaging in a reading ritual with Eileen Myles on the evening of Trump’s presidential inauguration. Shot during a period of intense political upheaval throughout 2017-18—with references to refugee migration, the Grenfell Fire, protest, and environmental collapse—the film is also spliced with intimate and everyday moments from Gibson’s day-to-day life: her children, her partner, at home, on the tube. The heterogeneous nature of these unfolding images, and the uneasy and anxious spaces in which chaos and the commonplace are often forced co-exist, should be a familiar sensation to anyone living through this period. The fragmentation is mirrored by the audio track, in which Gibson digresses from her own contemplations to reading from passages written by the poets Audre Lorde, Alice Notley, and Adrienne Rich. Oliveros’ ‘A Woman Sees How the World Goes with No Eyes’, a track from the original Crone Music, features on the soundtrack. Oliveros’ work on deep listening and sonic awareness also feels theoretically suited to the two videos being shown in the Reading Room—For Eileen, For CA (2018)—in which the poets read to camera, fostering a quiet familiarity in which performance, text, and sound coalesce. Towards the end of the film, Gibson reads from a love letter she wrote to her daughter, building up to the powerful final scene—a homage and re-staging of the last moments of Claire Denis’ Beau Travail (1999), in which the character Galoup dances alone in a night club to Corona’s ‘Rhythm of the Night’: a moment of escapism in the midst of profound vulnerability and crisis. Gibson performs this frenetic dance with her young son, who is wearing a green sequined wrestling mask. While the result is cinematic, it is not saccharine; awkward tenderness and bodily catharsis all converge. 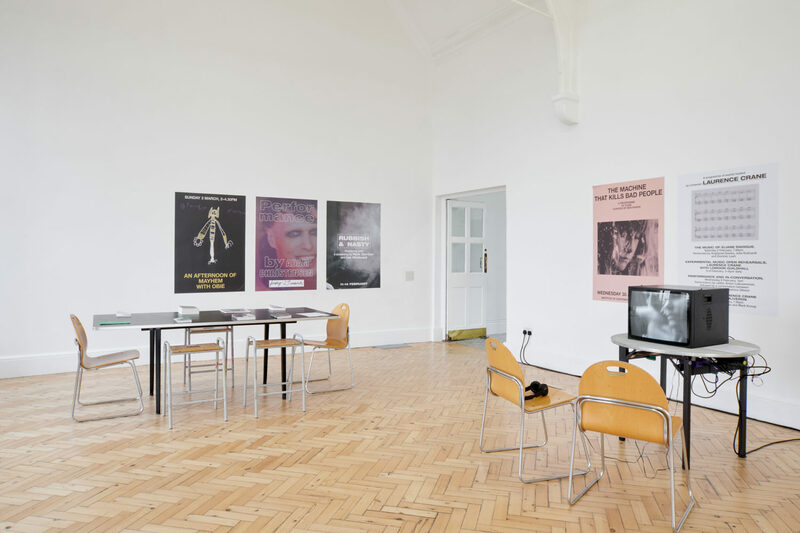 Made as a companion piece, the film ‘Deux Soeurs Qui Ne Sont Pas Soeurs (Two Sisters Who Are Not Sisters)’ (2019) is installed in Gallery 2. The film is based on Gertrude Stein’s enigmatic 1929 one-page screenplay, published in the back pages of an abstract crime thriller. 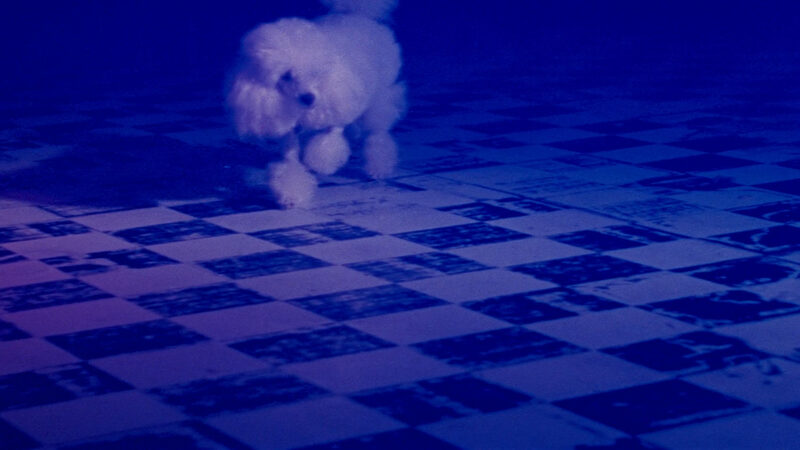 Stein’s absurdist script focusses on herself, her partner Alice B. Toklas, and their white pedigree poodle, Basket. Taking place on a Parisian street corner, many of the characters are twinned: two washerwomen, two poodles, two sisters. The commissioned atmospheric soundtrack, composed by Laurence Crane, was a response to the repetition, duplication, and doubling he interpreted within Stein’s original script and modernist oeuvre. Although the two films are not paired per se, they do open themselves up to one another. Notley—who Gibson quotes from in ‘I Hope I’m Loud When I’m Dead’—is physically present in the Parisian scenes of ‘Deux Soeurs’, configured as a literary descendent of Stein. The poodle can also be briefly seen running through the set before Gibson’s dance with her son. There are other subtle connections too, such as Adam Christensen’s haunting performance on the accordion in relation to Oliveros’ own mastery of the instrument. These layers of cultural inheritance—a kinship which exists outside family lines—intersects with the autobiographical mode. For ‘Deux Souers,’ Gibson cast the characters from her own network of artists, friends, and collaborators. However, in a coincidental twist, both Basma Alsharif and Diocouda Diaoune became pregnant during the process of filming—a serendipitous doubling—and their thoughts on the future bleed into the film’s dream-like narrative, co-mingling fact and fiction. Another unexpected event was the election of Bolsonaro in Brazil, alluded to by Ana Vaz in the scenes shot in Lisbon, and which mirrors the pre-war period in which Stein wrote her script, when fascism was gaining dangerous momentum throughout Europe. 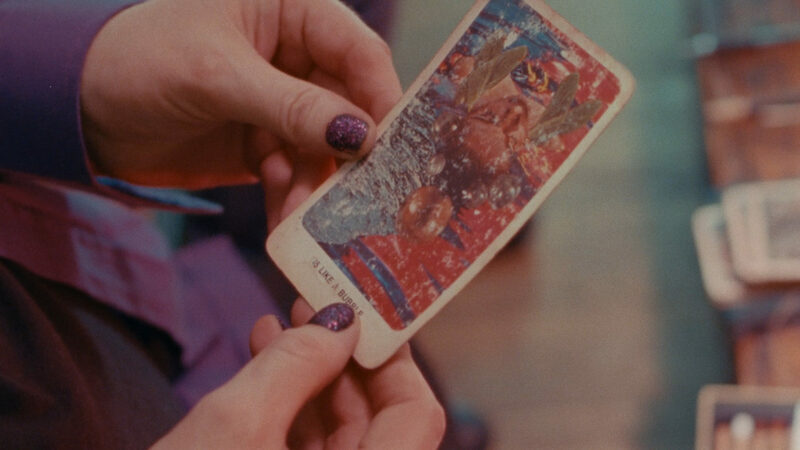 In the line that closes the film, Alsharif muses to her unborn child, “Our security is precarious here, but so is the entire world’s.” Gibson’s exhibition poses that, against the backdrop of this unstable world, there is solace to be found in collective action and cultural participation, in reading poetry, in making work, and ultimately, in being together. Leslie Thorton, Ana Vaz, Basma Alsharif, Mati Dop, Chantal Akerman, Barbara Hammer, Laida Lertxundi, Public Access Poetry, and Ute Aurand and Ulrike Pfeiffer. Philomena Epps is an independent writer and art critic living in London. She is also the founding editor and publisher of Orlando.